Sometimes being “snowed in” means just that. Wipe out the shelves at the local grocery store a few days in advance, put on fuzzy socks and stay inside. If not, your fed-up car could burst into flames while you try to force it though snow. On a day when the NYC roads shut down for blizzard conditions, a driver just one state away in Maryland ventured into the elements while behind the wheel. 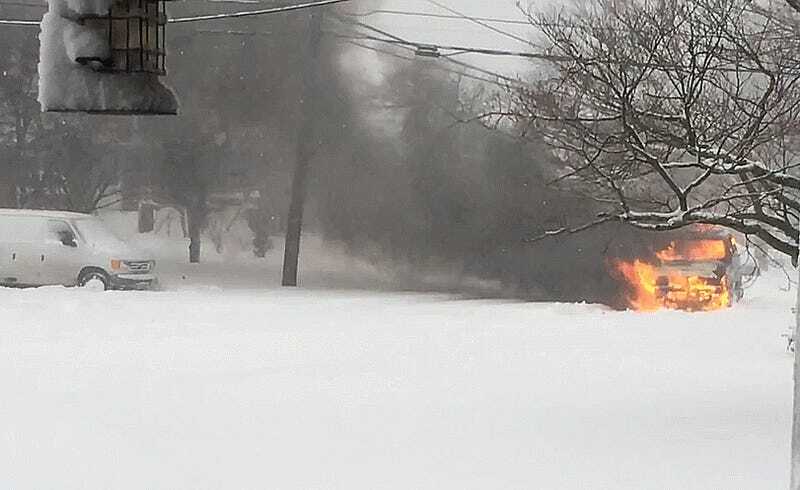 According to Fox 5 DC, residents in the area said the fire began when the driver tried a bit too hard to take the car up a snow-covered hill on Saturday morning. The car caught on fire after the driver got stuck at an intersection that luckily (and for good reason) doesn’t look to have any other cars at it. The video shows firefighters rushing to aid the car, while the person filming directs them toward the nearest hydrant that was likely buried in snow. when I got outside everyone was standing around on the side.... the only thing that firemen had to do when they finally arrived was to extinuish the fire... they did not have to go into the car at all...no one hurt. Plenty of people overreact about traveling in cold conditions—especially here in Texas—but there is a time for caution. Usually when snow is up to your knees and thick enough to light your car on fire.